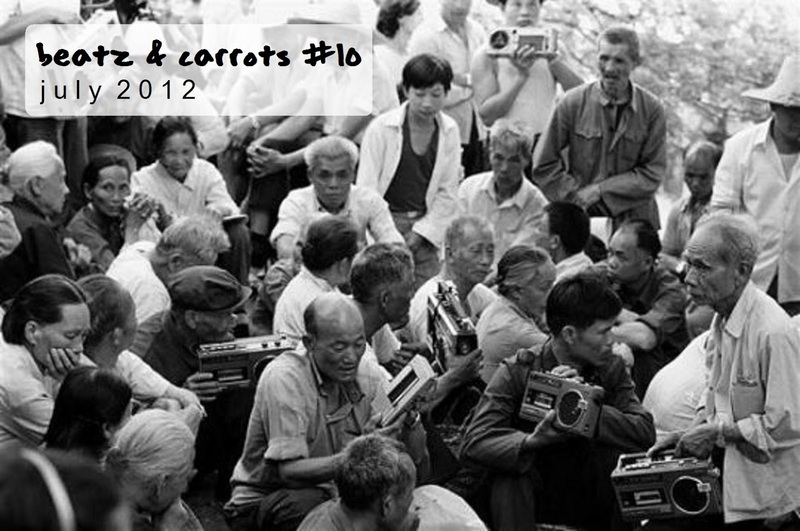 Trying to catch up with my monthly Beatz & Carrots compilations. Here is the July 2012 selection. After a nice intro which I have taken of an old Rocksteady song - the fire is on: Track #2 is Africa Boogaloo by Kalle et L'Africa Team de Paris. Well - just as the title suggests: an African boogaloo song. And a wonderful one! Mixing the sweet elements of Congolese music - already including a dose of Cuban Rumba - with the fiery rhythms of the 1960ies New York boogaloo sounds. You can find this song on the very good Honest John compilation The Latinization Of West Africa, which includes more songs in a similar vein. The next song takes on the Latin heat with Suonho's amazing re-edit of Joe Bataan's 1967 Latin dance cover of Gypsy Woman. I have had this song for a long time - but it only lately started growing on me. Now I can't live without it. Play this one out loud - and get boogalized! Sweeter than sugar, nicer than girl watching on a sunny day. Well, you know what I mean ;-) On track #4 Pillowtalk gives us a wonderful edit of the classic track Sunny sang by Bobby Hebb. If you have been following this blog for a while you should know that I am a huge fan of this song & its various covers. Look here fore more sunshine. Eek! Track #5 is a Disco Tech Edit of Ganja Smuggling by Eek A Mouse. And what is even better it is an edit of the live version which Eek A Mouse performed at the 1984 Reggae Sunsplash in Jamaica - giving us the full intro and a massive build-up. Big original - and great edit. The only thing I could add - wish the mastering on the edit would have been a little louder. Track #6 gives us The Chordettes with their huge 1954 hit Mr Sandman. Some websites state that "Mr Sandman" is the most popular 50s song of all time! Well - it for sure is "Sweeter than a candy on a stick" (like this girl vocal band is sometimes described). Track #11 is a sweet Alkalino rework of Nel Cimitero Di Tucson ("Last Man Standing" in English), which was composed by Gianfranco Reverberi for the 1968 Django Italo Western Preparati LaBara! (ft. Terence Hill). You’ll most likely recognize this song as the prevalent sample from Gnarl Barkley’s "Crazy". What an amazing Italo Western theme. Can't get enough of those horns. Track #12: Thornato who was also included on the last months Beatz & Carrots compilation with an AMAZING remix of Grupo Socavon's "Homenaje A Justino", is back with yet another tropikal monster tune: Marimba! Another song I can't get enough of! The last time I played at a club here in Chengdu - I played this song twice in a row - and the Dancefloor basically exploded in joyful shouts. Marimbas! Track #13 is a deep haunting remix by Nickodemus & Zeb of Little Dragon's Summertearz Inna Bottle, which Nickodemus shared on his soundcloud page a while ago - saying this: "Now that Summer's over, here's a fun 'lil remix we did of a live "Summertearz" version of the band playing into glass bottles & amp; Yukimi's impromptu vocals over the top." Track #14 is a Jeremy Sole Cumbia Dubplate of Whitney Houston's My Love Is Your Love. Perfect & smooth: Great intro, vocals from the original lady, airhorn, some cumbia bounce... R.I.P Whitney Houston. We continue with another classic R&B song - the Mary Jane Girls' smash hit All Night Long way back from 1983. Original old-school R&B like I like it: great vocals, the beat is hot, melodic and on point. Produced by the late Rick James. Track #16 is Barry Biggs cover of Evelyn "Champagne" King's Love Come Down. "Barry Biggs is The Expert on ultra-sweet Reggaefied version of well known hits. "Love Comes Down" is a classic, also in Barry's own rendering. Throughout his career, Barry Biggs has stayed focused on sweetness, sugar if you will. Spice he let over to others. Barry Biggs is a household name in Reggae when it comes to Lovers Rock even before there was such a thing and this track shows why." (Dubroom Reviews) Also check out this nice Disco Syndicate rework. Track #17 takes us to Hawaii: Nohelani Cypriano - Lihue. Hot Hawaiian balearic disco from 1977 and sought-after underground classic. More info here. I was trying hard to include the next song on this compilation. Track #18 by Childs & Moore from the VA - Goodfoot EP is an amazing rework of Stevie Wonder's classic Superstition: "Almost accapella, full of soul feeling and passion!" I am ending this compilation with an old favourite of mine: Al Jazzbo Collins hip re-interpretation of the classic fairy-tale The Three Little Pigs in a hip beatnik fashion. Taken from the album "A Lovely Bunch Of Al Jazzbo Collins And The Bandidos" (1967 - Impulse! Records). Swingin' Jazz, damn groovy and you have to be fast to grasp all of Al Jazzbo Collins humor: "Once upon a time in the land of Nitty Gritty there lived three little pigs. One of the little pigs was really cool. The other was more on the commercial side and the third was beyond the shadow of a doubt as square as they come..." Brilliant! PS. : This compilation fits perfectly on one CD - just click "NO PAUSE BETWEEN TRACKS" when you are going to burn it - and the CD will be exactly 79:50 minutes long. Just stumbled across you my friend, and i am so glad i did. Some totally new tunes for me, and i'm loving them all. Maybe we can swap links for our blogs. Dubme the crate digger strikes again!! Thank you so much my friend! I am now trying depositfiles... any other suggestions are more then welcome! Is it possible to get a re-up?